This brand new updated edition of the most comprehensive reference book on pancreatic disease details the very latest knowledge on genetics and molecular biological background in terms of anatomy, physiology, pathology, and pathophysiology for all known disorders. Included for the first time, are two brand new sections on the key areas of Autoimmune Pancreatitis and Benign Cystic Neoplasms. In addition, this edition is filled with over 500 high-quality illustrations, line drawings, and radiographs that provide a step-by-step approach to all endoscopic techniques and surgical procedures. Each of these images can be downloaded via an online image bank for use in scientific presentations. Every existing chapter in The Pancreas: An Integrated Textbook of Basic Science, Medicine and Surgery, 3rd Edition has been thoroughly revised and updated to include the many changes in clinical practice since publication of the current edition. The book includes new guidelines for non-surgical and surgical treatment; new molecular biologic pathways to support clinical decision making in targeted treatment of pancreatic cancer; new minimally invasive surgical approaches for pancreatic diseases; and the latest knowledge of neuroendocrine tumors and periampullary tumors. 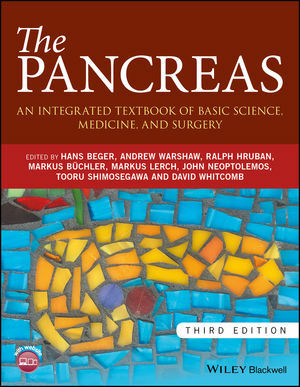 The Pancreas: An Integrated Textbook of Basic Science, Medicine and Surgery, 3rd Edition is an important book for gastroenterologists and gastrointestinal surgeons worldwide.